Background: Endocrine resistance and metastatic dissemination comprise major clinical challenges for breast cancer treatment. The fibroblast growth factor receptor family (FGFR) consists of four tyrosine kinase transmembrane receptors, involved in key biological processes. Genomic alterations in FGFR have been identified in advanced breast cancer and thus, FGFR are an attractive therapeutic target. However, the efficacy of FGFR inhibitors on in vivo tumor growth is still controversial. Objective: The purpose of this study was to evaluate the role of FGFR in tumor growth and breast cancer progression. Methods: Cell proliferation was assessed by 3H-thymidine uptake and cell counting in primary cultures of endocrine resistant mammary carcinomas and a human cell line, respectively. Tumor transplants and cell injections were used to determine in vivo growth and spontaneous metastasis. FGFR1-3 and αSMA expression were evaluated on primary tumors by immunohistochemistry. Results: Antiprogestin resistant murine transplants and a human xenograft express high levels of total FGFR1-3. In vitro treatment with the FGFR inhibitor, BGJ398, impaired cell proliferation of resistant variants versus vehicle. In vivo, versus control, BGJ398 treatment decreased one out of four resistant tumors, however all tumors showed a decreased epithelial/stromal ratio. 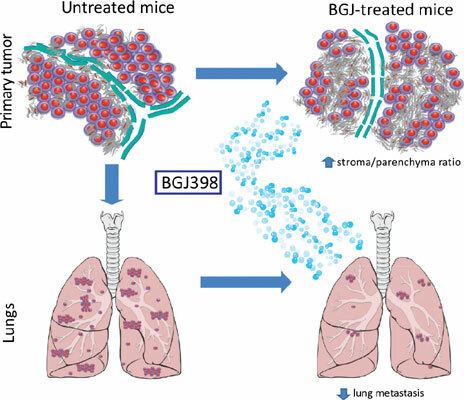 Finally, in a model of hormone resistant mammary cancer that spontaneously metastasizes to the lung, BGJ398 decreased the number of mice with lung metastasis. Conclusion: FGFR inhibitors are promising tools that require further investigation to identify sensitive tumors. These studies suggest that targeting FGFR combined with other targeted therapies will be useful to impair breast cancer progression. Breast cancer, FGFR, FGFR inhibitors, BGJ398, endocrine resistance, tumor progression.